Awning windows are hinged at the top and open outward, allowing for ample ventilation. Awning windows are often used with other window styles and are easy to open and close. They can be opened even during a light rain and are considered weatherproof. The majority of windows in homes today open with a sliding mechanism, however not all windows are built this way. There are plenty of window options, such as awning or casement windows that have hinges and swing open rather than sliding. These windows, particularly awning windows, have advantages that you probably haven’t even considered. Learning about things like weather resistance, enhanced views and improved security will help you determine if awning windows are right for your home. The average replacement awning window cost is $420 to $760 per window. 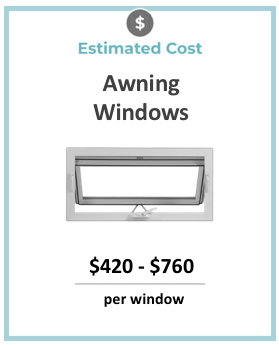 Your total awning window installation price will depend on the choice of window brand, size of the awning windows, window frame styles, and local costs of window labor prices in your area. Most companies will do custom awning windows if need be, but the standard for most awning window sizes if up to 6′ wide and 4′ high. Unlike casement windows, which open to the side, or double and single hung windows that simply slide one of the panes over the other pane to open, awning windows open with a top hinge. They create an awning affect that helps to keep water out even when they are in use. That means that you can have your window open during a heavy rainstorm without worrying about a bunch of water getting in. Try that with your single hung windows the next time it starts down pouring and let me know how it works out! There’s nothing like looking out a window without having to look around the muntins, the meeting rail and all the other horizontal and vertical frame pieces that cut into the solid glass. Sure some windows only have a single horizontal bar obstructing the view, but with awning windows you get an uninterrupted view since the window is one solid piece of glass. Since an awning window is made from one single piece of glass it will also offer you a higher level of insulation than many other window styles that have multiple seams that air can penetrate and awning windows are usually very well sealed. You’ll enjoy less airflow when the window is closed and higher insulation ratings throughout your home if you pick up an ENERGY STAR rated window. Awning windows can still be a more secure option depending on where they are installed. Awning windows can be installed much higher up on a wall than most other types of windows making it harder for someone to climb through while still letting in light. It’s important to consider where your awning windows will be installed, because they open outward. If the windows are positioned low enough they can create obstructions in your yard. 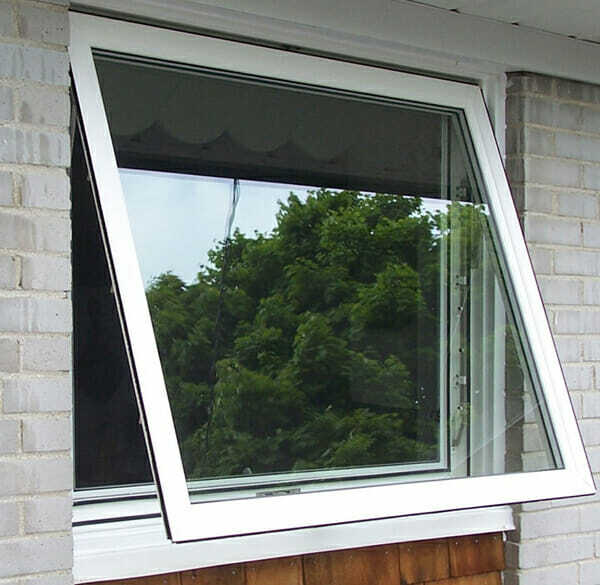 When placed in areas where paths, or regular traffic is common, awning windows can cause issues. Always consider how far out the window is going to open, and think about any problems the window will cause as a result. Awning windows will be hit by rain, roof runoff, and other types of moisture more often than traditional windows. The window will also catch dirt, grime and dust because it is creating a horizontal surface for things to land on. This means that you’ll have to clean the windows more regularly than you would with traditional windows. This might not be a major concern of yours, but consider how hard the window is going to be to reach and how much of a hassle it will be to clean on a regular basis. If you are more of a low maintenance homeowner, awning windows might not be the best choice.